As I finish wrapping up my last week full-time at the Communications Office at Mount Allison University and begin making the switch to part-time duties, I've been thinking about how thankful I am to have found something I really enjoy. I moved from being entirely uncertain about what I was going to do after graduation to having a broad foundation of knowledge in social media and knowing exactly the types of graduate school programs and jobs I plan on applying for. 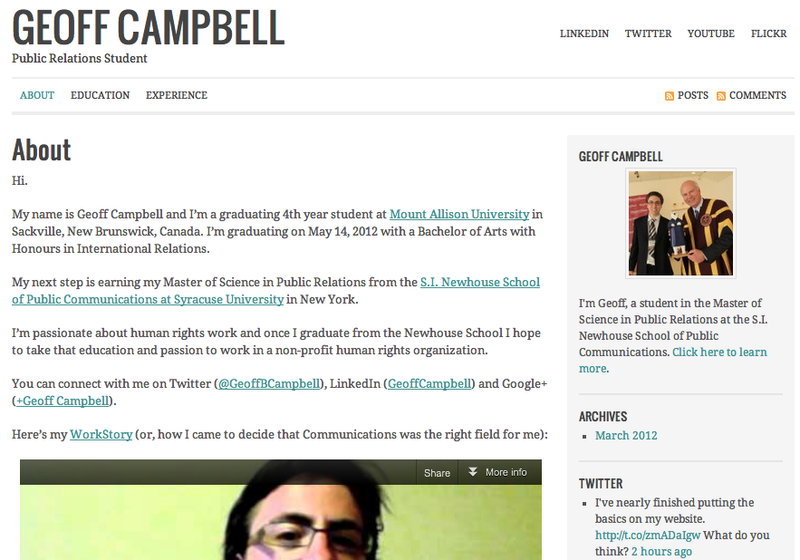 As I've mentioned earlier, I think that my part-time work as a blogger for the school was a initial step. However, the real catalyst that helped change my mindset about social media was the immensely supportive reaction of people to the short video I posted about the creation of NPR's now famously effective Facebook Page. It helped me realize that I could and wanted to work with it full-time. The 3 minute video features Eyder Peralta, NPR's Associate Producer for Social Media talking about how I created the Facebook page. The video has over 16,000 views and was featured on Techdirt, brandchannel, and YouTube Trends. Eventually I was interviewed about it by the school's Communication Office and the Argosy, Mount Allison's student newspaper (before I started working there and even before my position even existed). It was then featured on the Sackville Tribune-Post and even in my old high school district's quarterly magazine. Until then I hadn't really considered what I was doing online a viable option for full-time work but have since realized that I have an aptitude for creating web content (and since May, strategies for institutional social media use) when earlier I hadn't considered effective online communication as important job skill. I had assumed it was general knowledge but now realize it's a valued skill. I sent NPR fans a thank you message for their support and, despite my relative lack of experience in video production, it was met with a strong positive reaction. I sent the thank-you message because their reaction made me realize that I could do what I was doing in my spare time after my academic work was done as a full-time job. Not everyone is fortunate enough to find something they enjoy doing and find a way to make a living out of it. Since the video was posted in February, I applied for, was offered, and accepted positions as Online Editor for the Argosy, ATLIS, and Communications Assistant at Mount Allison University. At my job this summer I have written a photo essay about Mount Allison at Convocation, wrote various pieces for the school, methodically audited and then worked to improve Mount Allison's social media presence. My most recent project was helping to create a 20-video series of tips for incoming students. The work above helped reaffirm my interest in Communications and has led me to the decision to pursue a graduate degree in communications after my graduation in May. Related to my interest in communications is my passion for human rights. As President of Amnesty International at Mount Allison University, I went to Amnesty International Canada's Human Rights College and Annual General Meeting in Montreal where, among other things, I attended special workshops on public speaking for non-profit groups, effective media relations for human rights organizations with Amnesty International Canada Media Relations Officer John Tackaberry, and a presentation by Amnesty Canada's new Communications director on how Amnesty is using social media in its human rights campaigns. I'd love, in an eventually full-time job, to direct my knowledge and experience in social media to help non-profit organizations like Amnesty. I realize I've got a year left until graduation but I know that by May of next year I'll be on really strong footing to pursue my passion on a professional level. It was really all because of NPR and following the work of Andy Carvin and it made me realize that this is my calling. It is an incredible feeling to finally know what I want to do and know that I have at least some aptitude in it. While realizing that I could actually do this for a living took a lot of work and a lot of feedback based on that work, I may have never thought to consider it without NPR and for that I'd like to thank Eyder Peralta again for mentioning me in the original video and to NPR fans for being such a lively and supporting community. Do you really need a minor in college? Some say no. Have your say. Geoff at Mount Allison by Geoff Campbell is licensed under a Creative Commons Attribution-Noncommercial-No Derivative Works 2.5 Canada License. This is a personal weblog. The opinions expressed here are my own and not necessarily those of Mount Allison University. For official University policy visit their website.